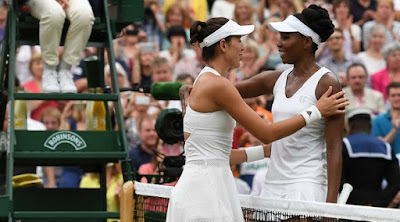 Garbine Muguruza stormed to her first Wimbledon title and shattered Venus Williams' history bid with a majestic 7-5, 6-0 victory in today's final. Muguruza overwhelmed Williams with a supreme display of power hitting in 77 minutes on Centre Court to become only the second Spanish woman to win Wimbledon. Watched from the Royal Box by King Juan Carlos of Spain, the 23-year-old finally got her hands on the Venus Rosewater Dish two years after losing to the American's sister Serena in her maiden Wimbledon final. Fittingly, it was Muguruza's current coach Conchita Martinez who was the first woman to raise the Spanish flag at Wimbledon in 1994 when she defeated Martina Navratilova. "The first set was tough. We both had a lot of chances. I'm glad I took mine," Muguruza said. "Two years ago I lost in the final against Serena and she told me I would win one day. Here I am. Finally!"